The city is faced with a massive challenge when it comes to treating wastewater. Of the 1000 million litres per day of wastewater generated only about 430 million litres gets treated every day. Stormwater drains are thus full of sewage and this ends up in our rivers, lakes and groundwater. Under a new set of projects additional waste-water treatment plants are being put up yet they may prove to be inadequate. On the other hand when one looks at smaller wastewater systems the city has more than 2000 of them according to Dr Anant Kodavasan, a member of an expert committee looking into the issue. Many of them are however are either dysfunctional or are performing below par. The installed capacity of these systems are close to 200 million litres per day, a significant volume. The best bet is for all the apartments and institutions that have these plants to get them evaluated and brought into efficient performance levels. The cost of the treated waste-water ready for use as non-potable water could vary between Rs 18 to Rs 30 a kilo-litre , significantly less than the water being purchased from private water tankers. The State Pollution Control Board insists on every apartment or layout which has more than 80 flats to have its own waste-water treatment plant. If these plants are located well , not hidden in basements, they consume less energy , treat water well and produce quality good enough to be used for flushing toilets and for the landscape. A systematic re-evaluation of these plants is therefore necessary to fit them into the overall strategy of managing waste-water in the city. With some treatment plants there is an excess of waste-water available on site. A system of sharing between apartments has to evolve and a market for its distribution created. ITC –Windsor Manor for example is able to give its treated wastewater to the golf club opposite since it has more than its requirement. These markets need to evolve further and should be facilitated by the BWSSB and the Karnataka State Pollution Control Board. Apartment owners, layout residents and institutions are doing the right ecological and economic thing by installing these WWTP’s for not only do they save money they ensure that the environment is not polluted. Investing in R and D , developing better models for operations and maintenance and better consumer education will go a long way in ensuring better water management for the city. I have been an ardent reader of your articles which appears every Saturday in The Hindu (Habitat). I have converted to become a farmer myself after nearly 20 years of Corporate service. We strongly believe in Organic Farming Practices and Sustainability, which of course, Rain water harvesting is one of major tool. In one of our farms extending nearly 20 acres we did dig up some trench and ponds for water to be collected during rain about 18 months ago. The last two years have been frustrating for us with insufficient rainfall and not able to see results with our effort. Also we had several people laughing at us and ridiculing our work. However, as we all know we received good rainfall on one day i e., on 6th morning in the early hours, it was for about one hour and approximately 35 mm of rainfall was recorded. The result, it transformed the entire area. 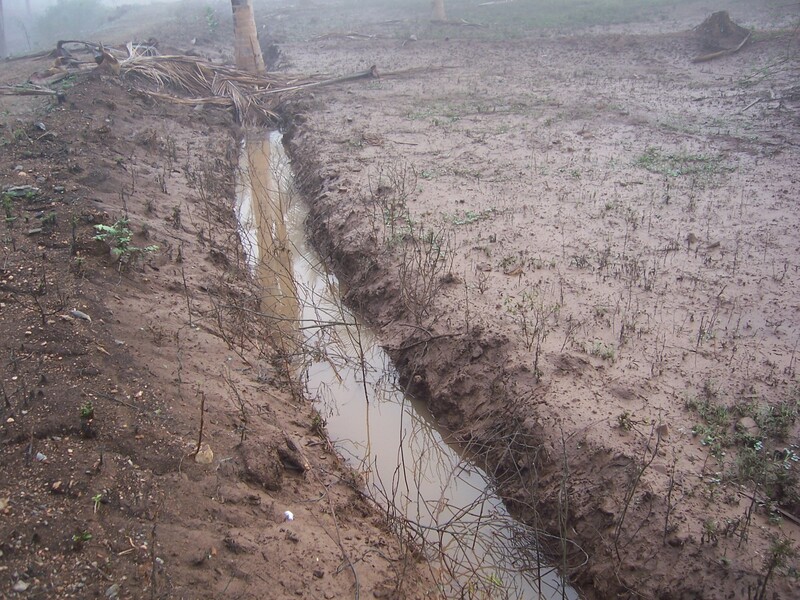 There were no major top soil erosion thanks to various trench which cut across the farm. 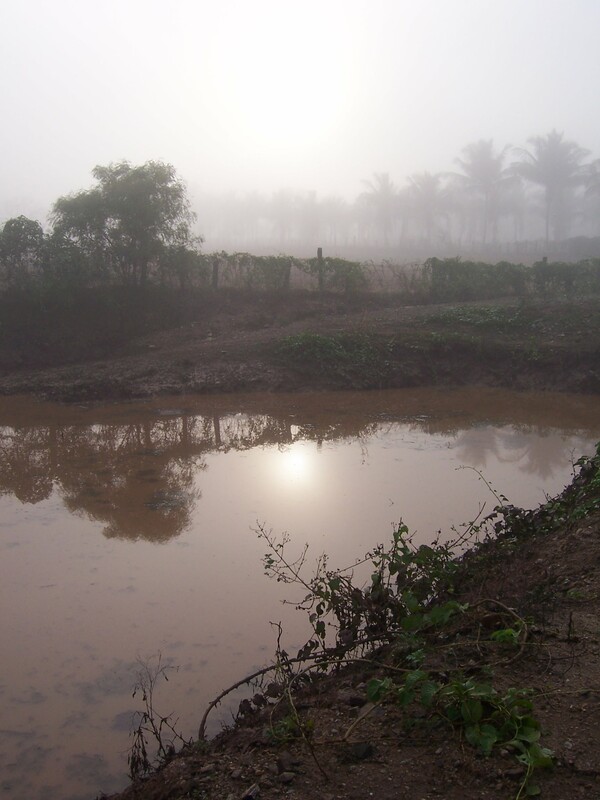 Two ponds exclusively created to collect water was filled to the brim. I have no more words to express than few pictures attached herewith. I also acknowledge much I was inspired and motivated by writers and activists like you to work in this direction. I wish to extend my heartfelt thanks on this occasion. With a vast majority of houses not connected to the main sewage lines in Bangalore the only recourse is to build septic tanks to receive waste water. Apartments on the outskirts too have septic tanks. Some house do away with this and build large soak pits, simple holes in the ground which receive the waste water and collect the solids but allow the liquids to leach away. These septic tanks and soak pits are highly polluting, transferring the nitrates and pathogens into the groundwater aquifer and contaminating it severely. Most borewells in Bangalore report high nitrate even to the depth of 600 feet. All the nitrate contamination comes from domestic sewage primarily. But there are many good alternatives emerging for the septic tank. One of them is called the DEWATS or the decentralised waste water treatment system. This in a broad sense is a major improvement on the septic tank with several up-flow chambers to promote anaerobic digestion. The treated waste water then comes to a reed bed chamber which makes use of sand filtration and reed bed treatment which takes up the nutrient load from the liquid effluent. Ultimately the remaining liquid is collected in a polishing pond and can be used for landscape use. Eco-san or ecological sanitation systems is another alternative. Here the liquid and solid waste in a toilet are collected separately. The liquid which has a major component of nutrients and very little pathogens is often used as a soil nutrient or fertilizer. The solids which have a high degree of pathogens is collected separately and carefully composted to eliminate all the pathogens before being used as a soil fertilizer. Waste water recycling plants are also coming into the market at an apartment scale and not yet at a domestic scale. These generally digest the organic load in the wastewater through a process of anaerobic digestion. After filtration and further treatment such as UV the remaining liquid is of sufficient quality to be used in landscapes or in gardens. All these systems have the potential of reusing the nutrient value of what we term ‘waste.’ They also reuse the water for non-potable purpose and prevent pollution of soil and water. But what if you already are using a septic tank or have a soak pit which is full? In Bangalore recently one sees a small spurt in specialised vehicles which make available the service of cleaning these filled septic tanks or soak pits. For a sum of Rs.1,300 or thereabouts, these vehicles, specially designed in Andhra Pradesh, will come to your doorstep and in a matter of 20 minutes empty your septic tank, sucking all the waste into the tanker through specially designed pumps. They will then transport the waste to the nearest treatment plant of the BWSSB for further processing or will ship it to the nearest agriculturist who will then use the manure rich in nitrates and phosphates. Earlier, cleaning of the septic tank was a smelly, gut-wrenching process, dehumanising with respect to those who cleaned it and leaving a scar in the entire neighbourhood. Nowadays, with entrepreneurship and modern technology, it has become easy to solve the problem. This is one sector where privatisation seems welcome. Now, if a safe handling and disposal protocol is built, it will make the handling of waste in the city cleaner and more hygienic, stop pollution of the soil and the aquifers and make city living a more pleasant experience. More power then to these technologies and the people who make it happen. Creating a business where opportunity exists and doing so to provide service to the community is but one small step in water wisdom. Managing wastewater is protecting fresh water and the water wise know that. You are currently browsing the Harvesting Rainwater blog archives for April, 2013.